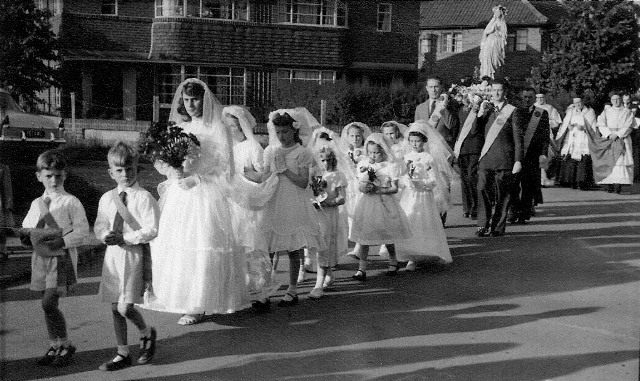 The photograph, taken in about 1957 or 1958 shows a May Procession in honour of Our Lady making its way down Priory Road towards the old Catholic church. A statue of Our Lady, followed possibly by Father Thomas Foynes, is being carried shoulder high. Immediately in front of the statue, escorted by her attendants is Betty Holly, the May Queen while in front of her are Paul Jobling (nearest the camera) and Calvin Smith. Thank you to Mrs. Jobling for the loan of the photograph.